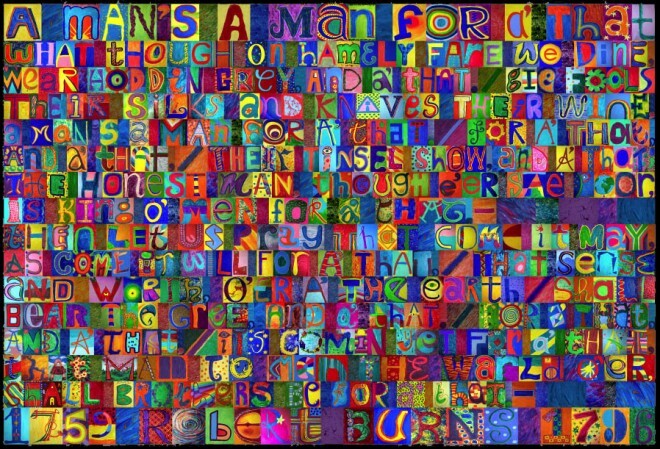 In partnership with artist Stephen Raw, the Scottish Poetry Library invited the Scottish Diaspora and those closer to home, to paint a letter which was collaged into the 'BurnsBanner'. Stephen drove over 4000 miles around Scotland gathering letters from the numerous workshops he ran. From Orkney in the north, to Dumfries in the south, to Eyemouth in the east and Iona in the west (and everywhere in between it seemed!) folk were keen to take part. 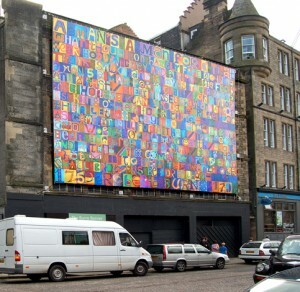 Showing two verses of 'A Man's a Man for A' That', this huge artwork was situated on Market Street, opposite Waverley Station in the centre of Edinburgh. 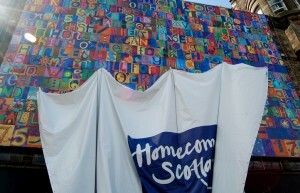 The Burns Banner was unveiled on 6 August 2009 at the start of the Edinburgh Festival and formed one of the events for 'Homecoming Scotland' becoming a spectacular creation to celebrate Robert Burns 250th anniversary. 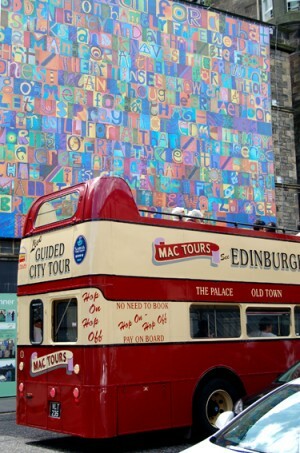 The project was funded by the Scottish Arts Council. 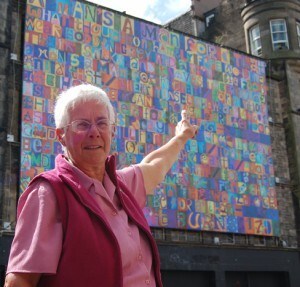 Many of those who made a contribution are on 'Making the Burns Banner' DVD by Juliet Rees. 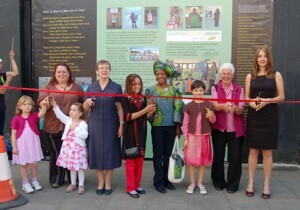 The unveiling party – scissors at the ready! Jan Sutch Pickard, who organised the Ross of Mull workshop, points to her letter 'g'. Stephen Raw (born London 1952) has lived in Manchester for the last thirty years. He has been a self-employed artist and designer since he returned to Britain from two years teaching at the National Arts School in Papua New Guinea, during which time he worked closely with Archie Brennan.